As the Samsung Galaxy S7 and Galaxy S7 Edge came and went last month, we’ve managed to see both of their capabilities demonstrated in a variety of tests so far. The variety of new features on the devices make for plenty of room and opportunity to carry out tests. Both the devices not only come with Qualcomm’s top hardware, but also with vastly upgraded camera sensors and a first time waterproof certification. Despite the significant amount of advances the mobile industry in particular has managed to go through over a short time period, a couple of features are yet to see major improvements. In terms of durability, while we’ve see device screens become better as things advance, they’re still not that durable, even as prices go further up. With the Samsung Galaxy S7 and the Galaxy S7 Edge, you won’t have to worry about your device getting bricked in case you drop it in some water. 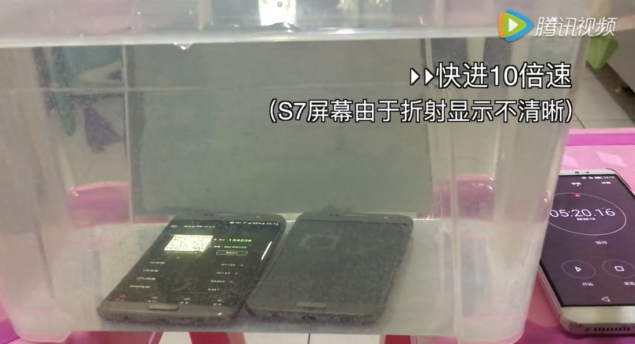 As more devices become available, particularly after Samsung launched the pair in China, we’ve started to see a large amount of tests surface, and today, you can take a look at both the Galaxy S7 and the Galaxy S7 Edge submerged under 20cm of water. 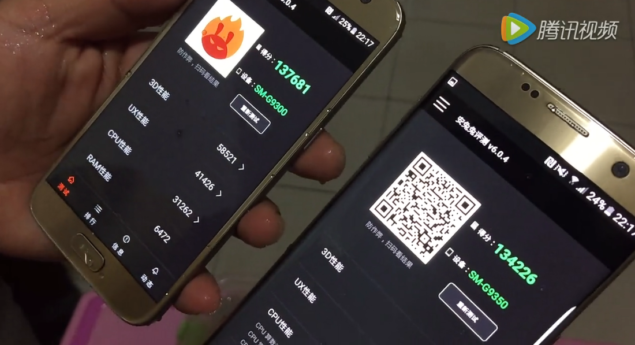 In addition to being submerged 20 cm underwater, we also see the popular benchmark Antutu being run on both the devices. 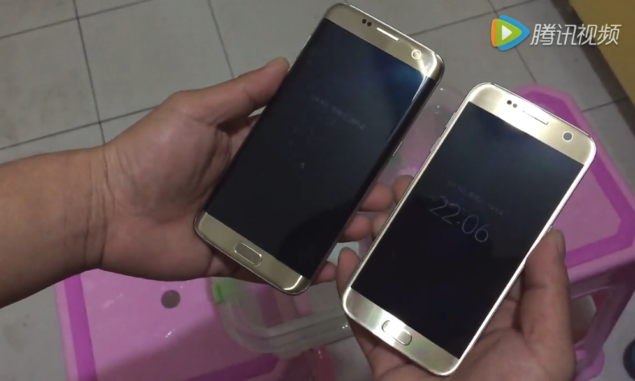 The final scores for both the devices can be seen in the image below, and we notice an interesting anomaly for the Samsung Galaxy S7 Edge being tested here. Just as our friend fires up Antutu on both the devices, before submerging them, the Galaxy S7 and the Galaxy S7 Edge display benchmark scores of 128495 and 87159 respectively. Given that hardware specifications are the same for both, the Galaxy S7 Edge‘s score seems a bit low to us. The device, coupled with its smaller variant, manages to leap back to a score of 134226, which is still lower than the Galaxy S7’s score of 137681. If you move past the benchmarks in the video, both the devices also display very fluid performance and seem to be completely unhampered after being submerged underwater for 5 minutes and 20 seconds. So if you’re wondering whether to upgrade to the Galaxy S7 or the Galaxy S7 Edge this year, this should be an added incentive to fork some dough out. Its nice to finally get to see waterproofing make it on board Samsung’s flagship lineup. So take a look at the video below if you’re interested for more and let us know what you think in the comments section below. Samsung Galaxy S7 Available at an Insane 70% Discount – Limited Quantities Available!